You know that feeling when you jolt awake after a nap you didn’t mean to take or a nap that lasted longer than intended? That’s exactly what a midseason premiere of How To Get Away With feels like. It’s a dizzying inhale. It knocks you out of time. It sends a powerful tension through your entire body. That’s all especially true for “He’s Dead,” which is told mostly in flashback—including some flashbacks to events that happen in the episode, which is one of my biggest pet peeves with this show. The structure and race-to-fill-in-the-blanks nature of this midseason premiere has a dizzying effect indeed. We finally see the scenes that were teased at the ends of episodes throughout the first half of the season, and they come together to form a more coherent picture than I expected. “He’s Dead,” in fact, is pretty logical, which isn’t always how this show operates. Michaela, Asher, and Oliver technically tell the cops the sort of truth about how Simon ended up shooting himself, managing to throw him under the bus without spinning too elaborate of a lie. Laurel’s baby is whiskey away to the NICU only to be transferred by her nefarious father, a move that Annalise tries to stop since she rightfully believes he doesn’t have the baby’s best interests in heart. Laurel wakes up to no baby, her panic intensifying once she finds out that her father, who is using her mental health against her as a ploy to gain custody, is behind her baby’s disappearance. The episode moves quickly and yet little happens; it’s mostly just characters reacting to the events of the midseason finale. It’s a bit suffocating. How To Get Away With Murder pretty much has two modi operandi: There are the episodes that go full dark, usually acting as spotlight episodes for Viola Davis’ supreme acting abilities, unfurling Annalise’s underpinnings and diving head-first into complicated systemic and cultural issues like racism, violence, sexual assault, and patriarchy. Then there are the episodes that are just fun, twisty murder fests. Sometimes episodes will combine the two, but “He’s Dead” is a bit of an outlier, continuing some of what was so wrenchingly off about the final scene of the midseason finale. It’s a depressing, dark episode without any of those extra layers. It’s heavy yet empty all at once. There are compelling bursts, like when the gang finds out that Simon’s alive after all and Oliver says they all deserve hell for not being happy about that news. 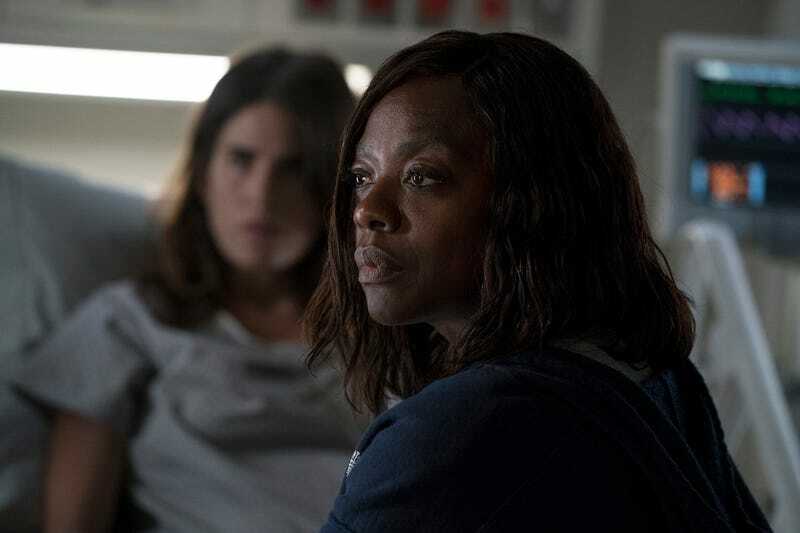 Aja Naomi King, Conrad Ricamora, Karla Souza—and of course Viola Davis—all give excellent performances. Souza manages to play the “where’s my baby” breakdown without coming off as painfully overwrought. And Davis makes sure that Annalise’s past is at the surface of her performance. We don’t need an explicit reminder of her losing her own baby to know exactly why she’s taking Laurel’s loss so hard. But some of the biggests twists of the episode play out like tedious maneuvering—mainly because the drama hinges pretty strongly on two very underdeveloped characters. Jorge Castillo remains a shadowy figure. We know he’s bad because he does bad things and always seems to be making entrances in nefarious slow-motion. But we know no specific details about the character or even his relationship to Laurel other than things that have sort of just been dropped in our laps unceremoniously. Dominic is an even more troubling character, especially given the turn he takes in this episode. We learn in flashback (duh!) that Dominic told Laurel not to go through with her plan to take down her father, warning her that he knew she was pregnant. Later in the episode, Laurel hopes this glimmer of humanity means that she can get Dominic to help her get her baby back. They grew up together, and he has spent his whole life just doing her father’s bidding, facts we’re just supposed to accept unquestioningly because she states them. There’s just one problem though: While torturing him to find out where the missing hard drive containing all of Laurel’s dad’s company’s information on it, Frank killed Dominic. Whoops! The dead person referred to by the title is (thankfully) neither Laurel’s baby nor Simon but rather Dominic. Dominic, we hardly knew thee. And by that, I mean we literally had no idea who you were or why you were Jorge Castillo’s henchman so it’s hard to really care about this twist that Frank killed you even though it is made a little more complicated by the fact that Wes apparently called you on the night of his death, calling to question your own culpability in said death?! Yep, that’s right: The episode ends with a dramatic voicemail from Wes on Dominic’s phone in which the deceased member of the Keating Five asks for his help. So the Castillo conspiracy is even bigger than we thought, which is an exhausting revelation, but hey, the story has to go somewhere. One henchman who’s mostly a plot device killed another henchman who’s entirely a plot device, and the reveal is edited well but mostly just cheap thrills. “You just never learn,” Annalise Keating says to the young adults who used to be her interns but now are the club of accidental murderers that she’s tasked with protecting for forever. Her exhaustion is a little too perfectly reflective of how it feels to watch this episode. How To Get Away With Murder jolts back after a lengthy break that somehow didn’t give the show enough time to breathe. It’s thrilling and moving in spurts but a dismal, disorienting episode altogether. Well, Isaac is just hanging around as a convenient plot device, which is I guess better than when he’s THE WORST THERAPIST EVER. Bonnie’s sass with Frank is one of my favorite parts of the episode. Michaela genuinely cares about Laurel, and that just makes me so happy. Tegan clocking Michaela as a liar so quickly makes Tegan Annalise Keating levels of iconic. Does Frank...ever do the right thing? On a show with a lot of idiots, he really is the biggest idiot.